In the coming months we will feature a number of Beer Dinner Breakdowns in which we will take a deeper look at craft beer dinners hosted throughout the Great Lakes region, specifically exploring how certain dishes offer complementary or contrasting flavors with their beer pairing. These beer dinners are based on publicly promoted information on websites and related social media outlets. In some cases, we’ll be working from actually attendance at the tasting, but in other cases it will be based on menu descriptions, beer overviews, and social media pictures and commentary. In each case we’ll give a quick analysis of why these pairings work and how to duplicate some of the flavor combinations at home. Our effort here has two broad purposes. First, consistent with our overall efforts here at Great Lakes Cuisine, we are seeking to explore and promote the flavors of the Great Lakes region. Second, we are hoping to offer a way for folks at home or who may not be locally based an opportunity to explore similar flavor combinations. We are not suggesting a quick paragraph of explanation will allow anyone to re-create a chef’s creation. We are intentionally simplifying to amplify flavor combinations and maximize the number of experiences. When we have been given a complimentary seat at the table, we will fully disclose that fact. Otherwise, this is just about exploring ideas, connections, and the emerging flavors of Great Lakes Cuisine. We welcome company on our journey. We were the happy recipients of pheasant breasts and pheasant sausage from a recent hunt club excursion. This is not our first time receiving the gift of pheasant, you can re-live our past culinary explorations here when we went with smoke and maple glaze. This go round we re-purposed the sausage into a Country Pâté and served the breasts topped with Carr Valley’s Black Goat Truffle cheese. Bring sherry and cherries to a boil. Allow cherries to re-hydrate for 30 minutes. Preheat oven to 325 degrees. Mix all remaining ingredients except bacon in a large bowl, strain cherries and add to mixture. The strained sherry has a lovely flavor and may be used in a cocktail or other application. Line a loaf pan foil and then place two slices of bacon on the bottom and one slice on each side. Fill pan with meat mixture and lay last two slices of bacon across the top. Cover with aluminum foil. Fill a 13 x 11 roasting pan with enough water to come half-way up the loaf pan and place a dish towel in the water under the loaf pan. Place in oven and allow to bake for about 2 hours or until it reaches 160 degrees. Remove and allow to cool. Wrap a brick in multiple layers of foil and place on top of the loaf, place in refrigerator for 12 hours. Using the foil, remove the meat from the pan, remove the bacon and discard. 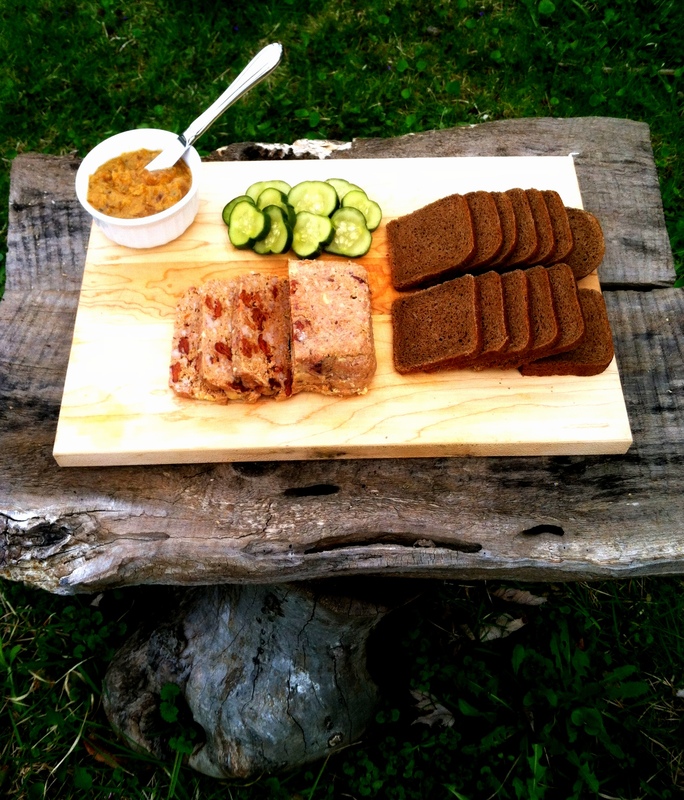 Serve with rye cocktail bread, stone-ground mustard and refrigerator pickles. We happened to have some stone ground malt vinegar mustard and an onion jam with thyme, which blended together to become a very lovely accompaniment. 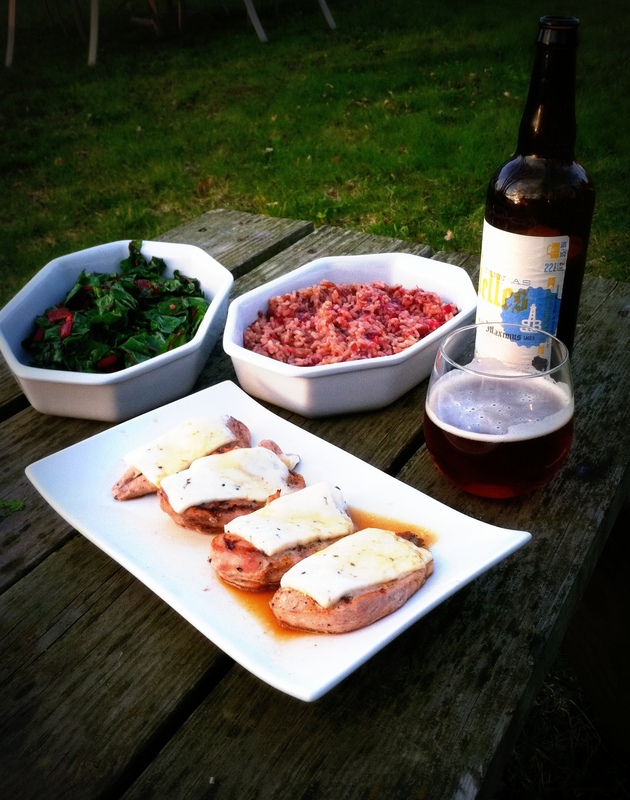 The pheasant breasts we grilled with just salt and pepper then topped with the truffle-infused cheese just before they were done, serving those with sauteed Swiss chard and a sprouted organic rice blend, each prepared similarly to our last post of red rice and kale. We then swirled in a half cup of mulled cranberries into the rice, which added spices and fruitiness to serve as a foil to the rich, truffled pheasant. It was the first dinner outside this year and we happily enjoyed it with a Fun as Helles, a specialty bottling from Big Bay Brewing. The malty sweetness of the Mai Bock perfectly complemented the earthy truffle flavors. To make the brine, bring cider to a boil with cinnamon, bay leaves, cloves, garlic, and salt. Simmer for 30 minutes then remove from heat and add ice. Adjust salt or water to yield a brine which tastes as salty as ocean water. Place chicken in 1 gallon freezer bag or large bowl and cover with brine. Place in refrigerator for 4 hours. To bake chicken, heat oven to 475 degrees. Remove chicken from brine and dry with paper towel. Combine salt and oregano. Cut cold butter into eight pieces and roll each piece in oregano mixture, then place under the skin of each piece of chicken. Place chicken in pan just large enough to accommodate all pieces in one layer, skin side up. Tuck onion and apples around chicken pieces. Bake for 30 minutes then turn oven down to 350 degrees. Toss acorn squash pieces in oil and spread on baking sheet in one layer, dust with seasoning. Place in oven with chicken. Heat one tablespoon oil in medium saucepan over medium-high heat. Add onions and cook until translucent, but not browned. Add rice and cook for an additional two minutes, stirring frequently to coat. Add broth and bring to boil. Then cover and reduce to simmer, continue to cook until tender, approximately 30 minutes. Heat one tablespoon of oil in a large fry pan over medium-high heat. Add garlic and saute until fragrant, but not browned, and lemon zest, salt and kale. Toss frequently until wilted, just 2 minutes. When the chicken has reached 160 degrees, approximately one hour, remove from pan and set aside covered for ten minutes. 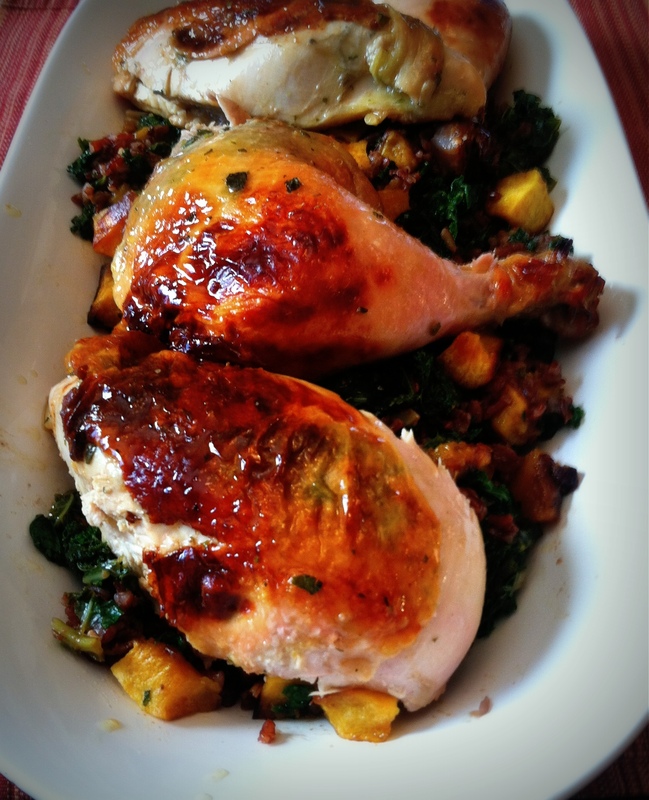 As chicken rests, stir the squash into the pan juices and allow to soak in the warm oven. 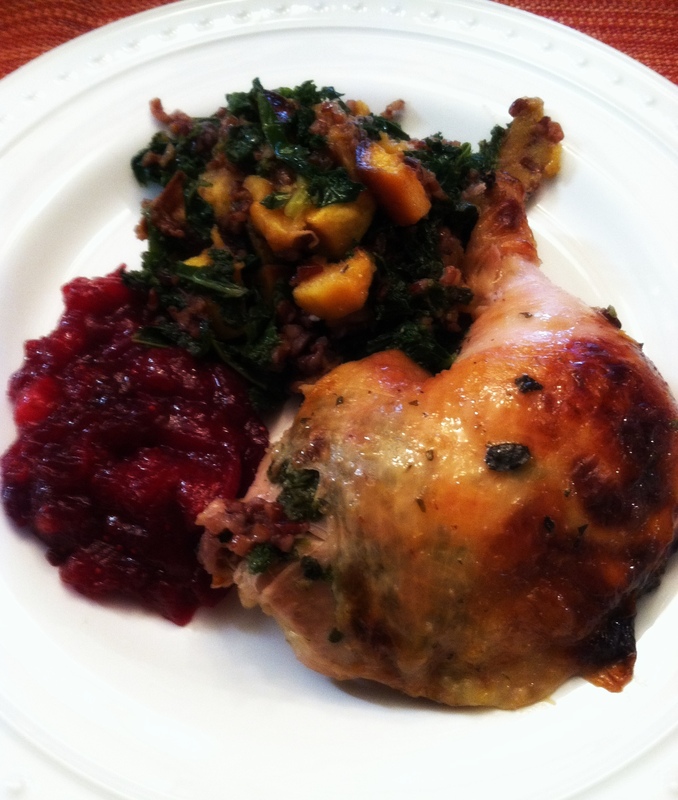 When ready to serve, toss kale, rice, and squash together in a large bowl, then fill a platter with the mixture and top with the chicken. Serve family-style. We elected to add a bit of mulled cranberries (recipe at the bottom of our Autumn post) to the meal which added a nice, tart counter-point to the sweet squash, but this dish can be served without. Though really more of a “autumn” dish based on flavors and seasonal availability of the ingredients, we enjoyed this in the still chilly days of early spring.